Zach Sanford will remember it for a lifetime. He came across the ice, corralled the puck and wristed the puck into the net to give the Washington Capitals a one-goal edge, and coincidentally, his first goal in the National Hockey League. He threw up his arms in jubilation as the puck crawled over the red line. Sanford was happy that he could finally get the first one at the highest level. Sanford, drafted 61st overall in the 2013 NHL Entry Draft by the Capitals, was called up from the Hershey Bears on Feb. 9 to fill in for Andre Burakovsky (out for five to seven more weeks with a hand injury). After Sanford scored the game-winner in a 6-4 win against Anaheim Ducks, teammate Brett Connolly picked up the puck to give to Sanford. His game-winning goal extended Washington’s home winning streak to 11 games. The Capitals tied the NHL record for as many home games with at least five goals scored. The milestone was set by the 1970-71 Boston Bruins. “Like, come on, get going, get going. But, yeah, it made it, which was good,” Sanford said about watching the puck roll into the net. Sanford was sent down to the Hershey Bears following the game on and called up again almost a week later. Trotz has yet to scratch the rookie, who has posted three points in his last two appearances. Sanford entered the Capitals organization as a journeyman. The NHL is the fifth league where Zach has played hockey. Foregoing his senior year at Pinkerton Academy, Sanford joined the Middlesex Islanders (formerly the New England Junior Monarchs) in the Eastern Junior Hockey League. He posted impressive numbers as the Islanders reached the EJHL playoff finals, falling to the New Jersey Hitmen in the best-of-three. The Waterloo Black Hawks in the United States Hockey League recruited Sanford for the 2013-14 season. Although his regular season scoring dipped, he tallied five goals and seven assists in 12 playoff games en route to the Clark Cup finals. 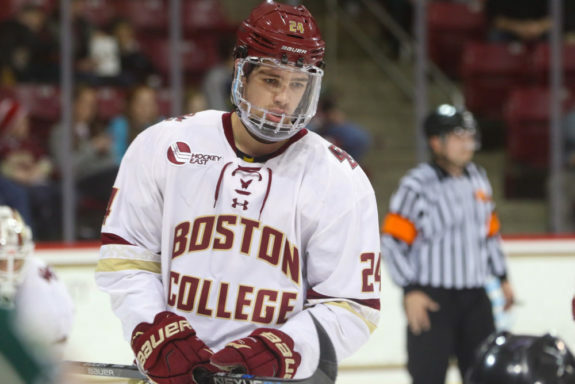 Following two years of junior hockey, Sanford brought his talent to the collegiate Hockey East conference. He enrolled in Boston College’s Carroll School of Management. He showed off his durability and smooth hands in front of BC’s rocking crowds. Sanford earned a roster spot every night as a first-year student and sophomore. He was one of six skaters to suit up in every game as a sophomore. Sanford contributed 26 assists that year. His game reached the point where the Capitals decided to court him. With a pitch from Trotz, Washington convinced Sanford to take his skills to the next level. On Feb. 12, Sanford was sent down to Hershey by the Capitals. The move has been effective so far. He picked up two goals in Hershey’s loss to the Bridgeport Sound Tigers on Feb 12. The Boston College product has 16 points (11 goals, five assists) in 25 games with Hershey, including this four-point highlight. It has been a different story playing for the big club. Sanford looked like a small fish in a big pond in the fall. Since then, he has scored two goals in his last three games played. Trotz slots the left-winger on the third line with Connolly and Lars Eller. Sanford and Eller are strong on the puck while Connolly is resurrecting his career. Sanford’s time-on-ice increases with every game he plays: 9:52 (Feb. 11), 10:09 (Feb. 18) and 11:46 (Feb. 19). Zach Sanford is taking advantage of the opportunity given, as he has done in every league. His confidence on the ice increases with every game. Washington might see him develop into a top-six forward in a few years. Due to his entry-level contract, he is protected this offseason from the looming expansion draft. Although his tenure in Washington could be short this year, the Capitals have a solid draftee for years to come.